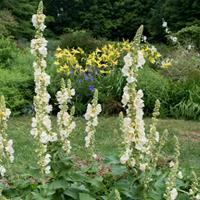 A beloved old plant once called Mullein Pink and Lamp flower. Brilliant magenta coloring contrasts with silver gray, woolly leaves on bushy branching stems. An easy to grow, long-blooming and low maintenance plant, great for dry, neglected spots in the garden. Summer bloom. Self sows. This product is not compliant with the United-States-Canada Organic Equivalence Arrangement (USCOEA) and is not certified organic in Canada. Starting Indoors: Start indoors 8-10 weeks before last frost. Cover with plastic to retain moisture until germination occurs. Keep at 65-70°F and provide light. Starting Outdoors: Direct sow spring to summer. Rose Campion performs nicely as an addition to areas that generally receive little attention, as it is drought tolerant and overall low-maintenance. looking its very best when planted in groupings. Great for borders. 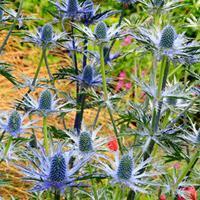 Cut back to ground level after bloom, especially if you want to curtail its spreading by dropped seed. After the ground freezes, provide a 2” layer of mulch to protect during winter in zones 6 and colder. Renew plantings by dividing in early spring every 2-3 years in zones 6 and colder; autumn in warmer areas or allow to self sow. Watering Details: Water regularly while establishing, then during especially dry, hot spells. Fertilizer: Mix about an inch of compost into the soil at time of planting, and top-dress every spring with a thin layer; scratch in. If soil is especially sweet, also mix in an inch or so of well-rotted manure to bring the pH down a bit. Plant: Mounds of silvery-green/grey, wooly stems and foliage; oval-shaped leaves up to 5" in length. Flowering: Dainty, magenta-pink single flowers about 1" wide. The genus name Lychnis likely refers to the use of a wooly species of this plant used for wicks in ancient times; the term is derived from the Green word lychnos, which means lamp.